A true customer-centric process is about understanding key user needs, creating a solution to meet these and then validating the designs to ensure they're successful. This post looks at methods of gathering direct user feedback and how this will shape your design. The validation phase, typically known as 'Evaluative Research' is where we start to gather direct feedback from users representing the key personas (identified during the initial 'Formative Research' stage) to ensure it meets their required needs. If the service doesn't meet these, it will fail. The sooner we identify this, then the quicker and cheaper it is to improve the solution. Quantitative is about capturing the 'what', the stats and relates to gathering a large number of responses from a particular persona type (minimum of 40+) so we can identify trends about user behaviours and if a task completion was successful or not. Qualitative is about capturing the 'why', and relates to gathering a smaller number of responses for a particular persona type (typically 5-10) so we can understand (through conversations) why they failed to/struggled to/successfully completed a task. We're not believers in gathering feedback on half-baked ideas or rough sketches because this can lead to unreliable results. Of course we want to learn fast and gain insight quickly, but we also need to learn smartly and follow the right procedures to understand success and deliver confidence that the design direction is the right one. However, failing smart doesn't mean we should spend months perfecting the wireframe solution before being put in-front of users. 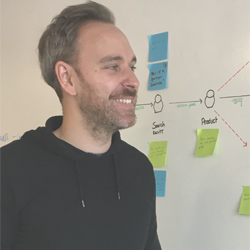 It requires a fine balance, a clear understanding of embedding customer-centric disciplines into an Agile process and knowing exactly what validation techniques to use (and when to use them). We've mastered these traits though years of expertise in creating engaging, intuitive and relevant solutions for the retail, finance and health sectors within Agile only methodologies.